Others in this plain red livery include 25 R125OFJ, 55 WA51ACO, with 56 currently being stripped down also. It seems the recent dark red fronted livery is out of favour so the new boss wants a rethink. 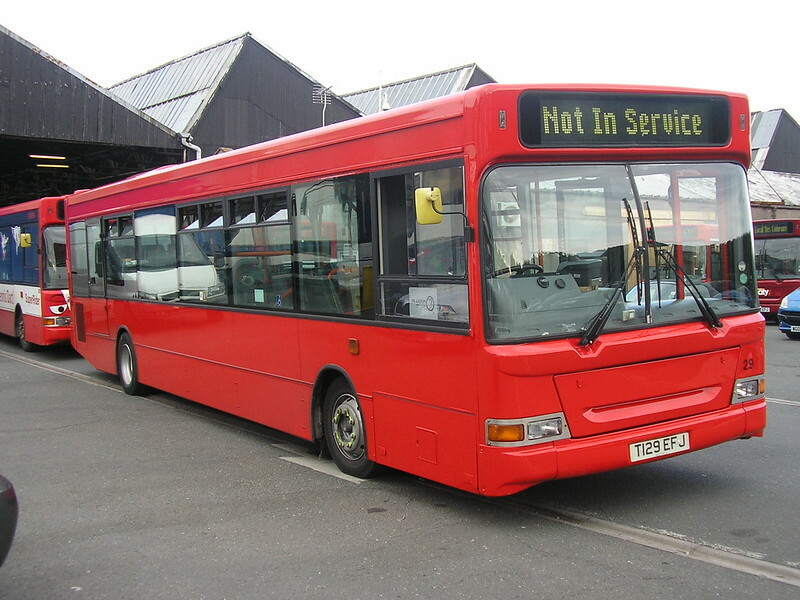 In the mean time buses due for repaint will receive plain red and then finished off into the new livery once its decided what its going to be. Its funny how the last time Plymouth tried a darker red (crimson lake) and cream livery they soon realised the error of their ways and reverted back to a much smarter red and cream livery. Expect to revert back to some sort of red and white scheme some time in the near future! Is 429 in service yet? Will be interesting to see what result we get from Richard Stevens, again I reckon we'll see a red & white livery! I find it hard to believe that a company that posted a net profit of £79.4 million last year and which also has it's own on-site spray shop can't find the cash down the back of the sofa to paint it's own buses..
its to do with the copyright of the design. Every bus they paint in the maroon livery PCB have to pay Stenning a lump sum of money. Thanks Anon. So why is it only Citybus who seem to be unwilling to pay Mr Stenning big bags of cash so he can cover his house in gold leaf, while other Go-Ahead franchises plus Stagecoach and First seem perfectly happy to do so? When did Citybus make £79.4 million profit. Utter nonsense. I do wish people would check their facts bfore posting such comments. "When did Citybus make £79.4 million profit. Utter nonsense. I do wish people would check their facts bfore posting such comments." "Errr... I think you might find that the figure of £79.4 million is for the entire Go-Ahead group"
I know, it was Mr Anon @ 20:10 who thought I was talking about just Citybus. "I do wish people would check their facts bfore posting such comments." They can't use Ray's design because of licencing issues. Not sure what will happen from here, shame as it was a smart livery which is already on s good proportion of the fleet. I personally was not that enthusiastic about the “Ray Stenning” livery. In fact I much prefer this interim livery which somewhat reminds me of the old NBC “poppy red” liveries. As you said maybe it could be broken up with some white to make it more of a traditional Plymouth Citybus livery? If you weren't talking about Citybus but Go Ahead then you should have made that clear. Putting the profit figure and the fact they have a spray shop in the same sentance would lead a reader to assume that you were just talking about Citybus. "Expect to revert back to some sort of red and white scheme some time in the near future!" How about an area of white above the windows and below the base of the roof. This would allow for the Plymouth Citybus and any other branding transfers/vinyl’s to be applied? Imo the new maroon front/vermilion rear livery looks smart and professional. The previous and various versions of red and white look a bit mickey mouse in comparison. Great shame if the new livery is dropped. How about a light grey / stone coloured front in place of the maroon? Would make the bus stand out in duller conditions and also would look smart whilst retaining tradtional colours. On the other hand, keep to simply red - simple and smart when applied right, as it has been. Agree with previous comment about the outdated former red and white livery - it needed a serious update.